JUSTICE Minister Charlie Flanagan has warned colleagues that leaking information from Cabinet meetings is a criminal offence. Senior government figures, including Taoiseach Leo Varadkar, are understood to be furious after it was publicly reported that the Cabinet was split on whether to call for HSE boss Tony O’Brien to resign. 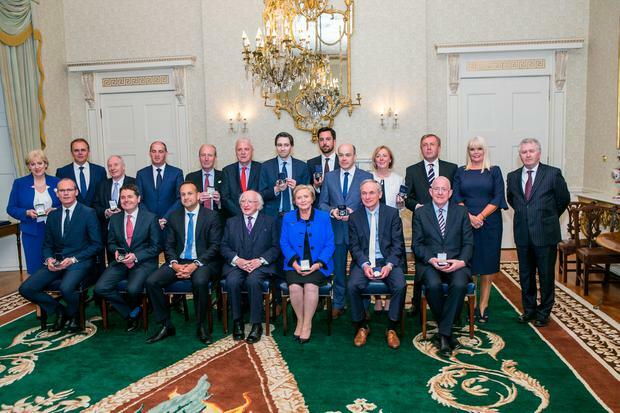 A number of media outlets, including Independent.ie, reported on Tuesday that ministers Katherine Zappone, Finian McGrath and Michael Ring believed the Director General should be forced from office. Ultimately they agreed to go along with the judgment of Health Minister Simon Harris who said the inquiry into the cancer scandal would be best served by keeping Mr O’Brien in place until July. The leak was raised at a private meeting of Fine Gael TDs and senators tonight where the Taoiseach said he was “very disappointed” to face public questions on a discussion that took place at Cabinet. A source said Mr Varadkar described it as a “very serious matter”. Former Finance Minister Michael Noonan went even further, saying leaks from Cabinet were a breach of the constitution and the Officials Secrets Act. He also criticised the level leaking from the weekly Fine Gael meeting which takes place behind closed doors in Leinster House. “He said people talking to journalists about private meetings were showing disloyalty to colleagues,” said one TD. Mr Flanagan then told the attendance that he had recently discussed Cabinet leaks with a senior garda and there is no doubt that they are a “criminal offence”. The minister did not elaborate on the conversation with a garda but one TD said it sounded like a casual conversation.